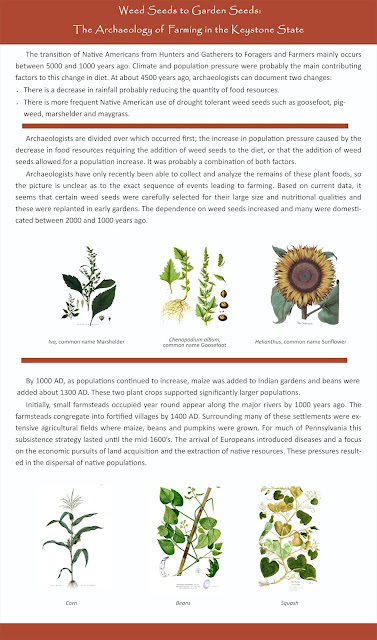 The Early Archaic period in Pennsylvania corresponds with the end of the Younger Dryas climatic episode and the beginning of the Holocene episode or the modern era at about 11,700 calendar years ago. This is a very interesting time because it witnessed the most significant environmental change of the past 40,000 years, although some argue that the current episode of global warming will turn out to be even more significant. Additionally, we see radical changes in projectile points from the unique fluted points of the Paleoindian period to the more common notched points of the Archaic period. 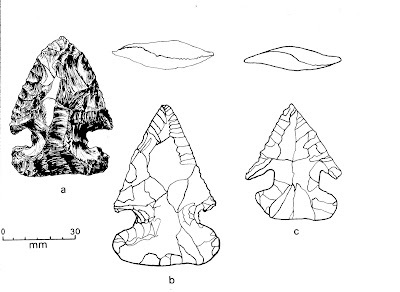 During the Younger Dryas, fluted points in the Northeast evolve from Clovis into points with longer flutes and a fishtail shape eventually leading to a decreased emphasis on fluting and finally to leaf shaped points with no fluting. Rather quickly, around 11,700 calendar years before present (BP), notched projectile points such as Thebes, Charleston, Palmer, and Kirk appear. Environmentally, at 11,700 calendar years ago, this is a transition between the cold, harsh conditions of the Pleistocene to the warming of the Holocene. The temperatures rose rapidly to modern conditions, but it required approximately 1000 years for the open spruce pine forest of the ice age to evolve into the oak and pine forest of the early Holocene and 5000 more years to become the oak-hickory and hemlock forest of the later Holocene. For Paleoindians, the long winters and coniferous forest did not provide many plant food and probably 60% of their diet came from hunting small game, deer, bear, elk, caribou in northern Pennsylvania and fishing. The closed spruce pine forest of this transitioning period between 11,700 and 10,200 calendar years BP also did not provide many plant foods, although the winters were shorter and oak trees, with their supply of acorns were increasingly available for both human and animal consumption. 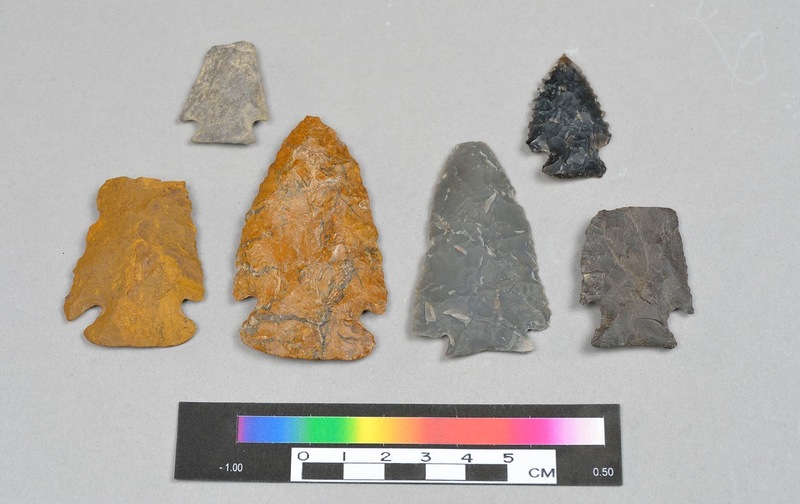 The drastic change in projectile points has always perplexed archaeologists. The change from lanceolate forms to notched forms suggests radical changes in the way they were hafted to the shaft. Lanceolate points are found all over the world, but only in the Americas are they fluted. The mechanism for hafting fluted points is generally understood, but why the need for fluting is a mystery. 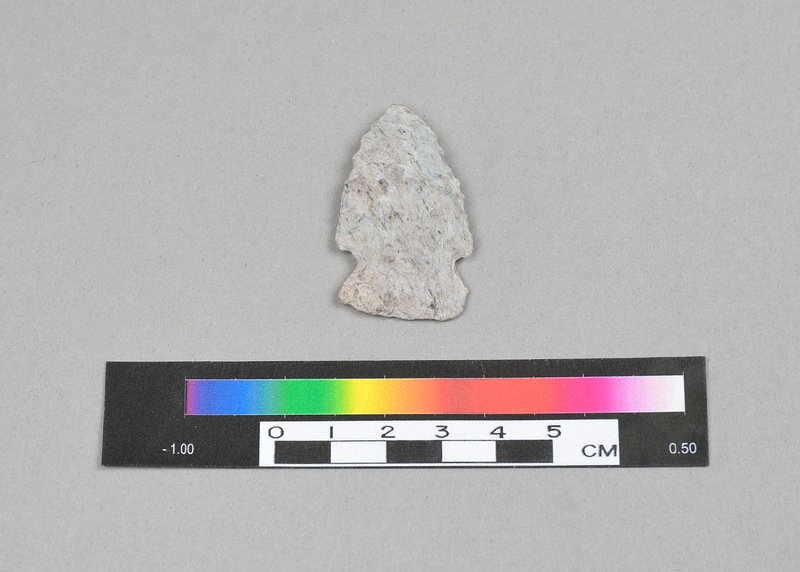 Some archaeologists believe that the change in spearpoint shape was related to hunting with an atlatl in the dense coniferous forest of the Early Archaic period. However, others argue it is more difficult to throw with an atlatl in a forest, so the jury is still out on this issue. Hardaway and Hardaway-Dalton points are basially thinned and notched and considered by some to represent a transition between fluted points and Early Archaic notched points but these are very rare in Pennsylvania. Whatever, the reasons, the most common Early Archaic projectile point types found in Pennsylvania are: Palmer and Kirk, corner notched types; less common are Kirk side notched and Charleston corner notched types and lastly, the Thebes type has only been recovered from a few sites. Generally, they all have a ground base and are serrated. Like fluted points, most are made from chert or jasper, although metarhyolite and quartzite was also used. Based on stratigraphic associations, the oldest of these seems to be the Thebes type. This is a relatively large, side notched or diagonally notched point. The blade is generally triangular in shape and the overall thickness of the point is generally greater than other points of this era. A distinctive characteristic of this type is that one edge of the blade is usually beveled suggesting that it was also used as a scraper or knife. Some have argued that this was its primary function (Justice 1987). These have not been dated in the Middle Atlantic region, but at Graham Cave in Missouri, they were dated to 10,854+570 and 10,557+429 calendar years BP (Justice 1987). Again, based on stratigraphic associations, the Charleston corner notched type occurs with the Thebes type and below Kirk and Palmer types (Justice 1987). These are relatively broad points compared to other types of this era. The blade is also frequently asymmetrical again suggesting they were used as knives or scrapers. Two Charleston points were dated to 11,408+750 at the St. Albans site in West Virginia (Broyles 1971). The Palmer corner notched type is a relatively small point with a straight base and frequently with more pronounced serrations (Coe 1964). The shape of the blade has been compared to a “Christmas tree”. They have not been well dated in Pennsylvania, but at the Thunderbird site in the Shenandoah Valley of Virginia, they were dated to 11,468+566 calendar years before present (Verrey 1986). At the Richmond Hill site in New York, three Palmer points associated with a hearth were dated to 10,595+180 calendar years before present (Justice 1987). Caption: a metarhyolite Kirk corner notched point dated to 10,334+302 calendar years BP from the Central Builders site (36Nb117). The Kirk corner notched type has a large, generally triangular blade with a straight or sometimes convex base. Compared to the Charleston type, the blade is less frequently asymmetrical. In addition, these points are thinned by flakes that extended across the mid-line of the point (Justice 1987). This type has been dated at several sites in Pennsylvania to between 10,730+412 and 10,209+30 calendar years BP (Carr 1992). Kirk side notched points are sometimes found above corner notched types in stratified alluvial settings and usually below bifurcate base points, but there are few if any dates on this type (Carr 1992). Kirk stemmed points have been found in the same levels as bifurcate points at several sites (Daniel 2011). The Early Archaic sequence presented above – Thebes, Charleston, Palmer, and finally Kirk seems reasonable based on stratigraphic associations. Daniel (2011) published a re-analysis of Coe’s (1964) work that essentially supports the above chronological sequence for these types. However, the radiocarbon dates do not support a sequence of dates for these types, but rather suggest several types were contemporary and were being used at the same time. Part of the problem is there are a limited number of dates and most of them cover a wide range of time. Or these types, in fact, overlap in time and were used throughout this period by different bands or had different functions. Obviously, it is necessary for archaeologists to obtain more dates from stratified contexts and use the most refined dating system available (ie AMS dates) to further our understanding of this time period. In conclusion, it is clear that the Early Archaic projectile point types were part of the adaptive strategy for exploiting the post-Pleistocene environment that was transitioning to a more diverse deciduous forest at about 10,200 calendar years BP. Although there is a slight overlap with Kirk points, bifurcate base points were the main lithic projectile point used to exploit this initial phase of the evolution of the deciduous forest in the Middle Atlantic region. We hope you’ve been inspired during these cold days of winter to consider the harsh environments that prehistoric peoples encountered and their survival techniques. A better appreciation and understanding of our past, helps us to consider change and adaptation for the future. If you’d like to learn more about the Early Archaic period, please check out other posts on this blog or the references provided below. 1971 Second Preliminary Report: The St. Albans Site, Kanawha County, West Virginia, 1964-1968. Report of Archaeological Investigations No. 3, West Virginia Geological and Economic, Morgantown. 1992 A Distributional Analysis of Artifacts from the Fifty Site: A Flint Run Paleoindian Processing Station. Ph.D. dissertation, The Catholic University of America, Washington D.C.
1998 The Early Archaic in Pennsylvania. Pennsylvania Archaeologist 68:42-69. 1964 The Formative Cultures of the Carolina Piedmont, Transactions of the American Philosophical Society, New Series, Vol. 54, Part 5. 2011 A New Look at an Old Sequence: Typology, and Intrusive Traditions in the Carolina Piedmont. In The Archaeology of North Carolina: Three Archaeological Symposia. North Carolina Archaeological Council Publication Number 30. 1987 Stone Age Spear and Arrow Points of the Midcontinental and Eastern United States. Indiana University Press, Bloomington. 1986 Paleoindian Stone Tool Manufacture at the Thunderbird Site (44WR11). Ph.D. dissertation. Department of Anthropology. Catholic University of America, Washington D.C.
For more information, visit PAarchaeology.state.pa.us or the Hall of Anthropology and Archaeology at The State Museum of Pennsylvania . The Section of Archaeology at The State Museum of Pennsylvania will again host an exhibit, complete with an authentic replica of a 20-foot long dugout canoe. 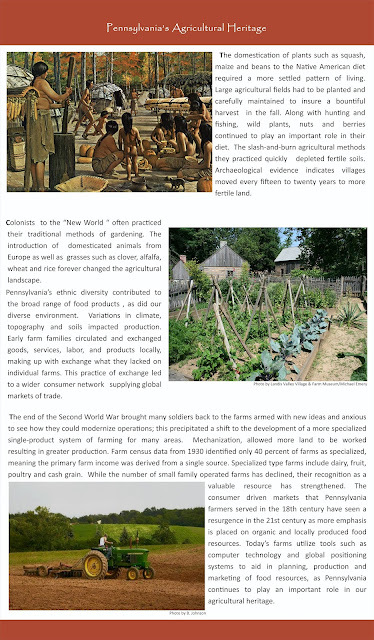 Our exhibit is entitled Foragers to Farmers, the Development of Agriculture in Pennsylvania. As you read in our last blog, Native Americans and then early settlers had a close connection to the land, which served to provide them with food and medicine. This exhibit explores some of those plants and how they were utilized by our ancestors and showcases some of the artifacts from Pennsylvania. Farming is more labor intensive than hunting and gathering and there is a debate in archaeology as to why early Indian populations in Pennsylvania gradually began focusing on seed plants such as goosefoot, lambs quarter, and maygrass for food; eventually growing these plants in gardens and finally adding maize to their diet. The dependence on maize in the diet begans about A.D. 1000 eventually leading to the development of large villages and significant changes in social organization. During the 1700s, European farms began to dominate the region and farming changed to include livestock and grains. By the late 19th and early 20th century, farming became more mechanized and fed huge numbers of people. The artifacts on display document this change over the past 5,000 years. A corn grinding station utilizing stone tools allows visitors to experience the process used by native peoples. Corn quickly became a food staple after A.D. 1200, spurring dramatic social changes. Small egalitarian groups of people grew into tribal societies. Another station will share information on types of native foods still utilized today and some recipes that you can try at home. This event is always an excellent opportunity for the State Museum staff to connect with the community. We talk to an average of 40-50,000 visitors each year at the Farm Show and share our knowledge with interested citizens of the Commonwealth. One of our goals in reaching out to the community is to share the significance of archaeology and to stress the importance of recording archaeological sites. The Pennsylvania Historical and Museum Commission is the state agency for preserving our historical and archaeological heritage. The State Historic Preservation Office (SHPO) records and maintains the files for all known sites across the Commonwealth. This database of information enables state agencies such as PENNDOT to plan for highway projects that will have the least amount of impact on archaeological resources. Archaeology is a labor intensive and an expensive undertaking. Avoiding sites reduces the expense of building roads or bridges. 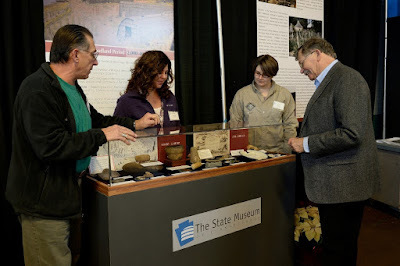 The Society for Pennsylvania Archaeology (SPA) is also participating in our exhibit as they have in past years. Representatives are on hand to answer questions about the Society and membership which includes the biannual journal, Pennsylvania Archaeologist, newsletters and meeting announcements. As an additional benefit of joining at the Farm Show you will receive three past issues of the SPA journal. Our booth will be located opposite the carousel in the Main Exhibition Hall of the Farm Show Complex. The Farm Show runs from Saturday, January 6 through Saturday, January 13, and is open from 8:00 am to 9:00 pm each day except the 13th when it closes at 5:00 pm. Mark your calendar and plan your visit to the 102nd Pennsylvania Farm Show (http://www.farmshow.pa.gov/Pages/default.aspx). Be sure to join us at the State Museum’s booth and take a ride in the dugout canoe. The views contained within do not necessarily reflect those of the Pennsylvania Historical and Museum Commission (PHMC) as a whole, nor the Commonwealth of Pennsylvania.Comments and discussion are encouraged. However, posts that are deemed inappropriate or offensive will be removed. Users will not be notified when content is removed. Copyright ©2010 The State Museum of Pennsylvania/Pennsylvania Historical and Museum Commission. Please contact us at ra-paarchaeology@state.pa.us .